This pathway focuses on digitalisation within the so-called ‘Automation Pyramid’. 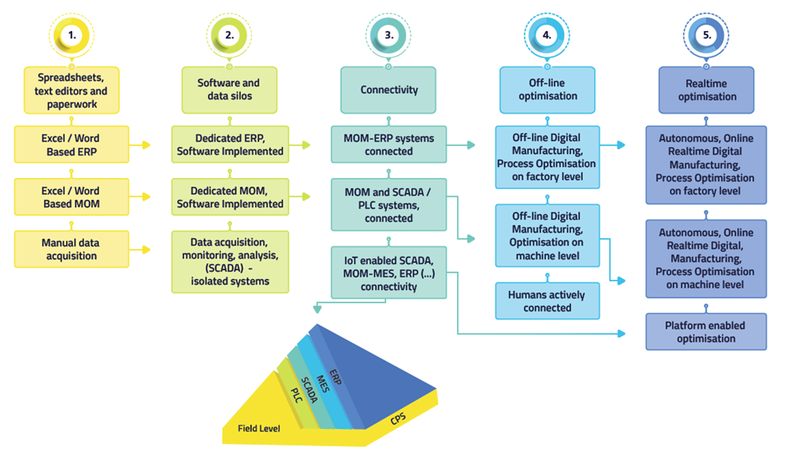 In this pathway, Level 1 reflects a situation that is still a reality in many manufacturing companies: data acquisition on the shop floor is done predominantly manually, while spreadsheets and text editors are used to do Enterprise Resource Planning (or ERP) and Manufacturing Operations Management (or MOM) including scheduling (also referred to as MES, Manufacturing Execution System). Level 2 involves the implementation of dedicated digital tools for doing ERP and MOM, while Supervisory Control and Data Acquisition (SCADA) solutions are implemented on shop floor level, connected to sensors and actuators and other field devices via PLCs or industrial PC’s. Level 3 focusses on the company internal connection of ERP, MOM and SCADA-PLC levels. This connectivity will increase the awareness of Enterprise Resource Planning about the status and condition of manufacturing operations, such as possible delays due to break-down or maintenance. 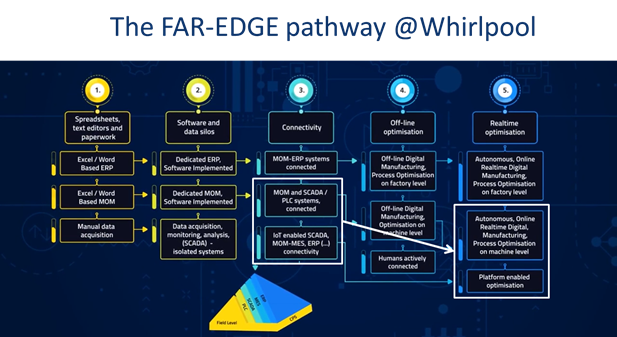 This level includes the introduction of Industrial connectivity approaches, such as the use of Industrial IoT, RFID, other wireless technologies or identification methods. In level 3 and beyond, the concept of Cyber-Physical systems is relevant, leading to a less hierarchical interpretation of the Automation Pyramid. Level 4 focuses on the implementation of more advanced optimisation approaches, either on factory level or on machine level. Another achievement in this level is the inclusion of humans in the digital information or connectivity loop. In level 5, optimisation can be done in real time on factory or machine level. The deployment of digital platforms for manufacturing is situated on this level.